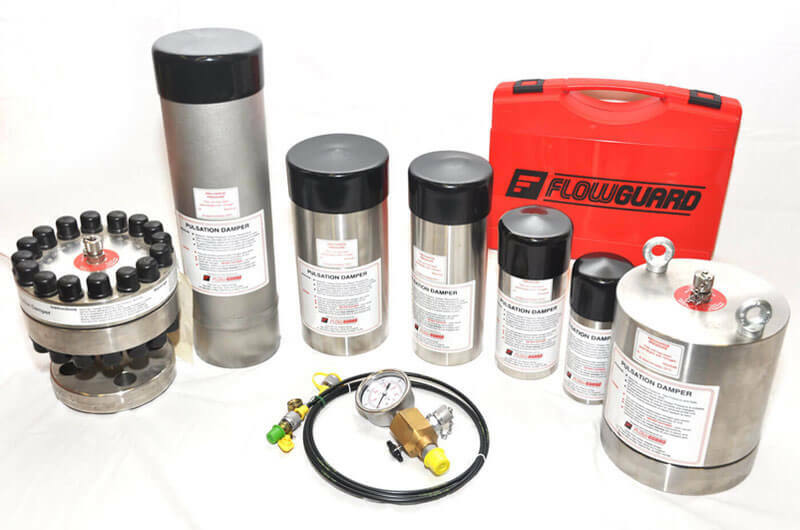 Flowguard Surge Absorbers use the same vessel design as the Pulsation Dampeners, but are designed to prevent damage to equipment and instrumentation when there is a sudden change in flow velocity. Piping systems often present themselves with pressure problems, either because of rapid closing valves in the system or by pump start-up or shut-down when a corresponding change in velocity introduces a rapid pressure rise. Besides the nuisance of pipe hammering, these surges can cause considerable damage, including line breaks and leaking flanges. Surge absorbers easily solve these issues by taking into account system pressures, volumes, acoustic velocities, and flow regimes.